Ed Ferner, a mentor of sorts, once gave me some simple but sage advice that’s worth passing along. “The Scripture was written FOR us but it was not written TO us.” As obvious as that sounds, though we pay lip service to this undeniable fact, we often ignore it. We know, for example, that Paul didn’t write Colossians directly to us, but because we understand that it has timeless applications and implications, we have a tendency to read it as though it was addressed to us. This slight change in mind has made the Scriptures come alive for me in ways I would never have dreamed. Therefore, I believe it is imperative to view Scripture through the lens of the writer and through the eyes of its recipients with the full realization that we are reading someone else’s mail. Clearly, the Bible was written and has been preserved for our benefit, but we read it as though it arrived with the morning’s paper, we will forever be confused. So, if we are faithful in this regard, we will, through the power of the Holy Spirit who resides within, unlock many truths in God’s word that have escaped us (and so many countless others) for generations. Bold you say? Perhaps. Arrogant? Not really. Possible? Absolutely! I always assumed that the early church fathers who we revere so much, had each been given a special interpretive key into the mysteries of God. In my opinion, this mediator-type system’s vestiges had their beginnings in a state-controlled church where the Word was not entrusted to the “masses”. Now more than ever we have the tools available to study God’s word that even the elite scholars of the 3rd century lacked. We have access to the entire Bible in 40 translations from Arabic to Russian at the stroke of a mouse click. We can search the Scripture for every usage of “The kingdom of God” in less than a second. We can scan through the exhaustive writings of Josephus and Tacitus in the blink of an eye. And we have the capacity to ferret through what we formerly took at face value. We need not remain in the dark relying on others for our doctrinal positions. Early in my Christian life many of us relied heavily upon the notes written in the margins and at the bottoms of each page. C.I. 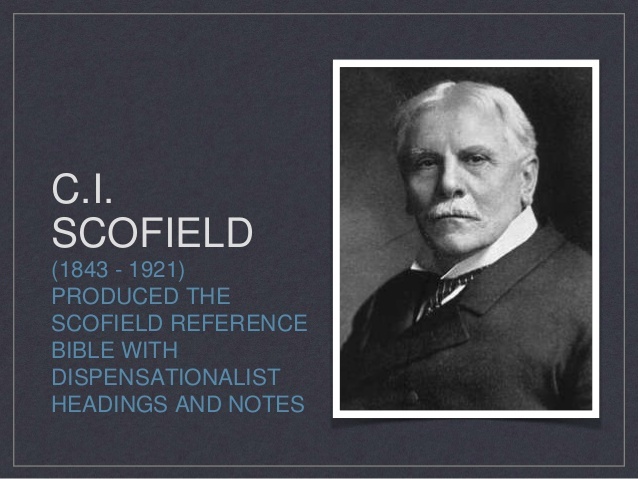 Scofield (through his Scofield reference Bible) indoctrinated generations simply by making his theological system so readily available. Many treat those notes as Gospel not realizing that they are nothing more than a built-in commentary of his opinions. It was so easy to read a passage and then immediately determine what that section actually meant, or so I thought. But as I discovered Scofield too often misinterpreted the Greek in order to fit his paradigm. Was it intentional? I don’t know but it nonetheless can cause serious problems. For example Scofied substituted the meaning of the Greek word genos for genea (generation) in Matthew 24:34. An oversight we hope but if used properly as genea this would have been a huge nail in the coffin of his dispensational system. Jesus said, “Assuredly, I say to you, this generation will by no means pass away till all these things take place. Genos (1085 Strong’s Greek) means offspring, stock, kin or a people. The correct word, Genea (1074 Strong’s Greek), means an age, generation or time. As you can see, the meaning of the verse changes drastically with this small error. “This generation shall not pass away” carries with it an entirely different meaning than “This race will not pass away”, which was found in Scofield’s original notes. So with the capacity to check lexicons and sources, we no longer need be held captive to these kinds of mistakes whether they were intentional or accidental. Though some defend Scofield to the nth degree, I think there’s good reason to maintain a healthy dose of skepticism. Although we have the technological advantages over the early church fathers, we lack something that we must make up for. And that’s proximity to the source. They had an understanding of the times & culture associated with the writers of the Scripture that we lack. Our westernized mindset is a huge stumbling block to proper interpretation. Therefore, we must go back be diligent to study the historical setting, culture and times surrounding the Bible. Only then can we begin to grasp the Word in context. If we extract the contents of Paul’s letter to the Galatians or John’s Revelation to the expectant believers in Asia Minor (modern-day Turkey) and put those words into a 21st-century context, we will not ascertain the full meaning of what these writers intended to convey to their readers. Audience relevance is absolutely critical. In Acts chapter 2 verses 16-21, what was Peter’s explanation to those present at the Day of Pentecost regarding the supernatural abilities of the unschooled Galileans (who were speaking in the many languages of those present or perhaps the crowd was hearing in their own language)? Peter begins to quote Joel, “in the last days…” and then proceeds to give a list of things that would happen in the time of the end. Most of us extract those words “last days” and transport them in a time machine 2,000 years future into the year 2007 and we assume that we are living in the “last days”. But is this what Peter was implying? He was applying the term “last days” to exactly what they were experiencing right then, 2,000 years ago. 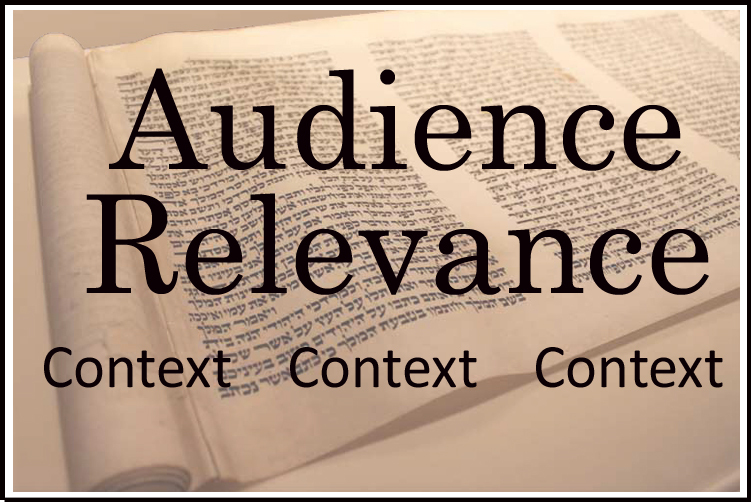 So, if we forget the Biblical hermeneutic of audience relevance we are likely to misinterpret the passage. 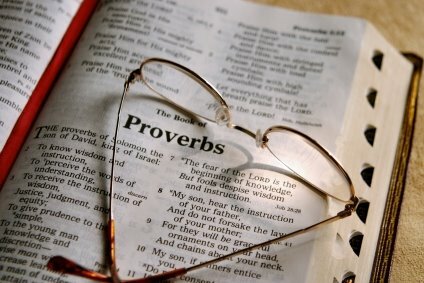 Therefore, it is imperative that we put on our 1st-century glasses when we read the words of the apostles. Without a working knowledge of the times, customs and settings we will never uncover the truth and we will continue to be frustrated with our inability to make sense of God’s word. And this will ultimately result in apathy regarding our thirst to read His word. It’s very difficult to stay motivated when you are constantly confused. A good friend, Pastor James Saxon, used to say time and again that we must interpret the unclear in the light of that which is clear. When the Bible uses terms like, at hand, shortly, soon, or in a little while, it is imperative that we avoid assigning an arbitrary vagueness to these words of imminency. That will do great damage to the context of these passages of God’s Word. When reading these time sensitive statements we must not allow our minds to become clouded and misapply a verse such as 2Pet 3:8, “With the Lord a day is like a thousand years”. We must be both intellectually honest and consistent. For when Jesus says, “I shall be with you a little while longer, and then I go to Him who sent Me” was He not referring to a short time period? Then when in the book of Hebrews we read, “For yet a little while, and He who is coming will come and will not tarry“, do we change the meaning of “a little while” to fit our long-held presuppositions? If we don’t consistently apply word meanings (always in context) then we are in danger of remaking the Scripture to fit our preconceived paradigm. This is known as eisegesis i.e. reading our biases into the text. At the very least, this kind of confirmation bias (confirming our views by manipulating what we read to fit our preconceptions) sets our feet on rather dubious interpretational ground. Approximately 500 years before fulfillment, the prophet Daniel was told to “seal up the vision” for it was “many days in the future” at the “time of the end“. Yet in John’s Revelation he was told, “do not seal up the words of the prophecy of this book, for the time is near“. This is truly a remarkable contrast, but one that is not often considered. So how can pastors and Bible students believe with any degree of intellectual honesty, that Daniel’s sealed vision which was prophesied to take place “many days in the future” (approx. 600 years to fulfillment) be significantly shorter than the unsealed Revelation’s contention that the “time is near” (which is supposedly almost 2,000 years and counting)? Do you see the glaring problem? We would never consider performing this kind of word gymnastics with any other form of literature, but when it comes to the inspired, inerrant Word of our Creator, we tend to discard reason. Why? Because of the expectations created by our paradigm. “Say what you like,” we shall be told, “the apocalyptic beliefs of the first Christians have been proved to be false. It is clear from the New Testament that they all expected the Second Coming in their own lifetime. And, worse still, they had a reason, and one which you will find very embarrassing. Their Master had told them so. He shared, and indeed created, their delusion. He said in so many words, ‘this generation shall not pass till all these things be done.’ And he was wrong.” He clearly knew no more about the end of the world than anyone else. C.S. Lewis was being honest and for that he should be commended. However, it is quite sad that even this great stalwart of the faith had no hermeneutical grid with which to effectively understand these prophetic passages. Take heart. Jesus didn’t delude anyone and neither did the NT writers. There is a theological system that can effectively answer the tough questions that the many like C.S. Lewis were not able to deal with. In fact we can make sense of New Testament statements of imminence while increasing our reverence for the inspired Word. We can know that Jesus meant exactly what he said and that He fulfilled his predictions in the exact time sequences in which they were stated. We don’t have to hide from the atheistic, Judaistic, or Islamic websites and proselytizers as they incessantly trot out Jesus’ Words per Matthew 24:34, Matthew 10:23, and Matthew 16:27-28 in an attempt to discredit Scripture. However, in order to do this it is imperative that we set our presuppositions aside and be open to what the Scripture teaches regardless of the implications. For most of us a rather seismic paradigm shift is in order—and process can result in periods of uneasiness and uncertainly. For a season, every answered question may find two taking its place. But I can attest that there is in fact a light at the end of the tunnel—it’s Jesus in all His revealed glory! A type of Biblical language that seems to create a great deal of confusion and consternation is the recurrent use of figurative speech. In order for us to begin to understand God’s plan throughout history we must effectively recognize apocalyptic language and metaphoric speech while allowing Scripture to interpret Scripture. We see this kind of writing in Isaiah, Ezekiel, Daniel and even in the Psalms. Upon first glance we are prone (by our westernized 21st century mindset) to take the words of Daniel 8:10 literally—“…and some of the host and some of the stars it threw down to the ground and trampled on them.” In 1837 Adam Clark referencing the above verse wrote, “The destruction of the Jews by Antioch Epiphanes, is represented by casting down some of the host of heaven, and the stars to the ground.” Daniel is not speaking of the dissolution of a planet but the judgment of a nation. So when we read this same type of language in the Second Testament we must not change our interpretational grid. Have you ever asked or been asked the following question… Should God’s Word be taken literally or figuratively? The truth is that it must be interpreted both ways. A great obstacle that we must overcome is that our westernized mind is so far removed from the times when Peter dropped his nets into the Sea of Galilee. Surely when we read, “For every beast of the forest is Mine, and the cattle on a thousand hills” we realize that God isn’t saying that the thousandth and one hill is up for grabs. Or when Jesus said, “Destroy this temple, and in three days I will raise it up”, we don’t get the picture of a supernatural construction company of angels working around the clock for 3 days building a temple more marvelous than the one that was destroyed. Did they get it? Did they think he was speaking literally? No, they didn’t have a clue & yes, they interpreted His statement literally just like we oftentimes do today. Many warn us against “spiritualizing” too many texts but don’t think it doesn’t happen often in all forms of eschatological systems. 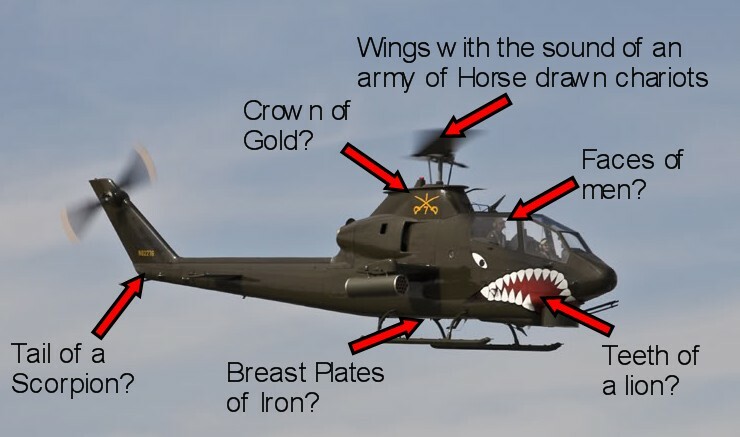 Those that claim to be literalists have equated the locusts mentioned in Revelation 9 to Cobra helicopters. So he who is without figurative language cast the first stone of heresy. It is quite obvious that all Scripture cannot be taken literally. So the question shouldn’t be whether to use a consistent literal or figurative hermeneutic—it should be a question of when. For example: When we read “All the stars of the heavens will be dissolved and the sky rolled up like a scroll; all the starry host will fall like withered leaves from the vine, like shriveled figs from the fig tree”, how do we interpret these words? In our 21st century mindset most of us think that this is a prediction of the destruction of the earth at the end of time. Let’s take a closer look. This prophecy was uttered by Isaiah in chapter 34 verse 4 and is clearly announcing the desolation of Bozrah the capital of Edom late in the sixth century BC. This is judgment language as referenced above in Daniel 8 & it’s quite clear that it can’t be taken literally since we are still make earth our temporal residence. As I sidebar, read Isa 13 & 34, Micah 1, Nahum 1, Ezek 32, & Psalm 18. And let’s not let the word “you” in Matthew 26 escape our notice. Jesus said, “YOU will see…” as he was speaking directly to Caiaphas. Nothing like dropping a bombshell on our eschatological paradigm! The Word of God is the unfolding of the Greatest Story Ever Told and we do it great disservice by compartmentalizing its contents as though we are reading hundreds of different unrelated stories. We separate the Old and New Testament like it was some sort of God-ordained division when in fact we can see Christ clearly on page after page of the Old Testament. The plan of redemption is clear from Genesis to Revelation. God has always been sovereign & his plans were not & can not be thwarted. His plan has been unfolding throughout history with the precision of a Swiss watchmaker. It has always been by faith and never by our own effort that has given us acceptance before a perfect & holy God. The New Covenant didn’t abolish the Old – it fulfilled and completed it. The Old Covenant was merely an imperfect shadow. Christ’s work of redemption on the cross & His coming in judgment 40 years later in AD 70 (against a wicked & perverse generation) was the perfect fulfillment of that which had been foretold & so masterfully weaves God’s new with the old when he writes, “…“A new covenant”, He has made the first obsolete. Now what is becoming obsolete and growing old is ready to vanish away. It was growing old & it did in fact vanish with the destruction of the temple & the entire sacrificial system in those horrible days of tribulation as Titus obliterated Jerusalem. Prophecy was indeed fulfilled but yet since many of us know so little about history, sadly those still waiting for a future fulfillment seem more numerous than the grains of sand in the Sahara. Since this Old Covenant passed away, we now worship God in spirit and in truth and no longer are we constrained to meet God in boxes or buildings since we are now the temple of the Holy Spirit. For we are the New Jerusalem which comes from above & we are joint heirs with Abraham in the Kingdom of God which has come. We have not replaced Israel but become partakers in the promise. Nationality, circumcision, obedience nor any outward manifestations of our humanity would ever become a pleasing aroma in God’s holy & perfect kingdom. It was by faith then & it is by faith now that we enter God’s eternal peace. God is never forced by man’s rebellion to resort to alternate plan B’s, C’s, or D’s. And it is with this backdrop that we study God’s word with the confidence that through the Spirit’s illumination that we can understand the mystery of God. Our God is in complete control and He shall reign forever & ever, Amen! I would highly recommend Frank Turek’s “Cross Examined” podcast and specifically this one regarding “There are no verses in the Bible.” Frank gives a number of very helpful “how not to interpret the Bible” tips, some of which is discussed above. This entry was posted in Audience Relevance, Eschatology, Hermeneutics. Bookmark the permalink.